Here's the full text of Prime Minister Narendra Modi's address to the nation where he announced the demonetisation of Rs 1,000 and Rs 500 notes with effect from midnight on November 8-9. 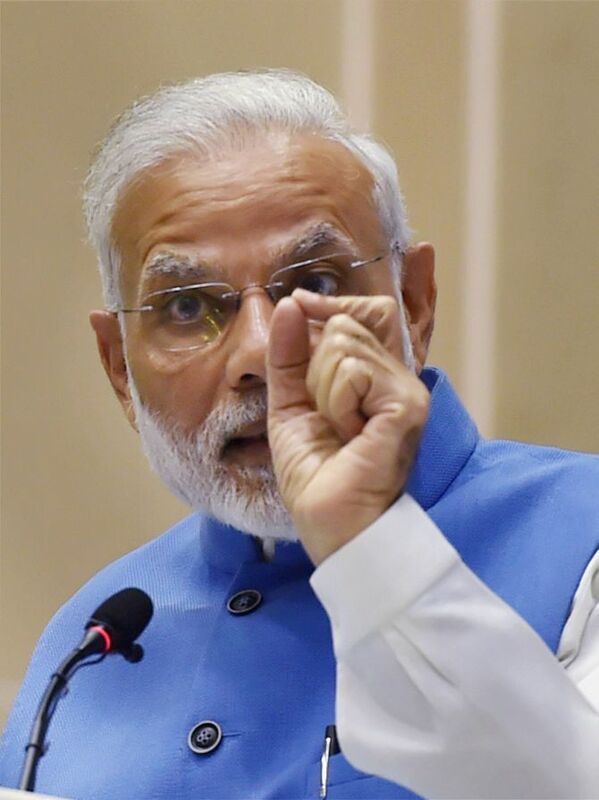 The Pradhan Mantri Jan Dhan Yojana, the Jan Suraksha Yojana, the Pradhan Mantri Mudra Yojana for small enterprises, the Stand-up India programme for Dalits, Adivasis and Women, the Pradhan Mantri Ujjwala Scheme for gas connections in the homes of the poor, the Pradhan Mantri Fasal Beema Yojana and Pradhan Mantri Krishi Sinchai Yojana to protect the income of farmers, the Soil Health Card Scheme to ensure the best possible yield from farmers’ fields, and the e-NAM National Market Place scheme to ensure farmers get the right price for their produce -- these are all reflections of this approach. 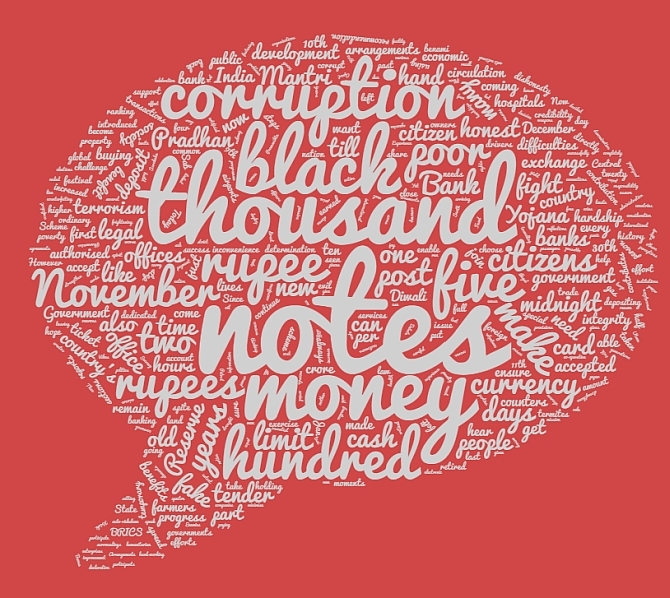 IMAGE: A word-cloud analysis of the prime minister's speech. Clearly, the thrust of his speech was towards cracking down on black money and counterfeit currency in circulation across the country. The magnitude of cash in circulation is directly linked to the level of corruption. Inflation becomes worse through the deployment of cash earned in corrupt ways. The poor have to bear the brunt of this. It has a direct effect on the purchasing power of the poor and the middle class. You may yourself have experienced when buying land or a house, that apart from the amount paid by cheque, a large amount is demanded in cash. This creates problems for an honest person in buying property. The misuse of cash has led to artificial increase in the cost of goods and services like houses, land, higher education, health care and so on. To break the grip of corruption and black money, we have decided that the five hundred rupee and thousand rupee currency notes presently in use will no longer be legal tender from midnight tonight, that is 8th November 2016. This means that these notes will not be acceptable for transactions from midnight onwards. The five hundred and thousand rupee notes hoarded by anti-national and anti-social elements will become just worthless pieces of paper. VOTE: Do you support scrapping of Rs 500, 1,000 notes?